Window functions are a wonderfully useful SQL technique. They make complex aggregations simple to build. 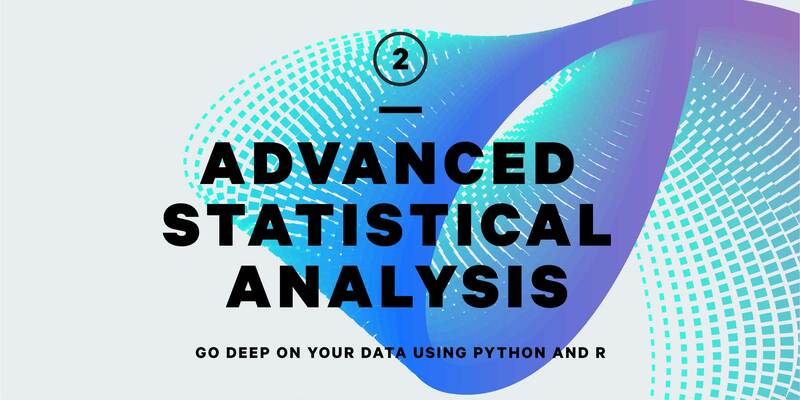 After using them to great effect for everything from selecting only one row, to computing running averages, to breaking out day-over-day changes, we thought it was high time to explain them in more detail. Let’s start with some data from a video game company. For each platform, we want to know how many times a user played a game on that platform, and what percent of all gameplays that platform has. count(1) / (sum(count(1)) over ())::float as "% of plays"
The window function in this query is sum(count(1)) over (). sum(count(1)) gives us the total number of gameplays. over () specifies to aggregate over all the rows without collapsing them. Thus this function gives us the total number of gameplays across all platforms. The count(1) in the numerator is not part of the window function, and so it applies to all rows in the group, giving us a per-platform count. Quartiles or deciles can be a very useful way to split a dataset. Window are by far the easiest way to do this in SQL. Let’s look at user spend quartiles, and the min and max spend within each quartile. The inner query gives us a table of spend per user. 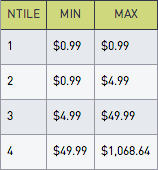 The middle query annotates each row with the quartile — ntile(4) — of spend. Finally, the outer query aggregates the rows into just the min and max of each quartile. Say what you will about cumulative metrics — they are certainly to be used sparingly — but they are easy to calculate with window functions. Here we’ll compute a running sum of all revenue. The inner query defines a simply daily sum of all revenue. The outer query makes it cumulative, summing all the values between the first day and the current day. That’s accomplished with rows between unbounded preceding and current row. For each row, unbounded preceding begins the sum at the beginning of the table, and current row halts the sum at, well, the current row. rank() gives the row’s number, and over (order by plays desc) specifies the order in which to apply the rank. Often we want a separate ordering for different parts of the table. This is what the partition feature enables. It splits the window function, applying it separately to each specified partition. 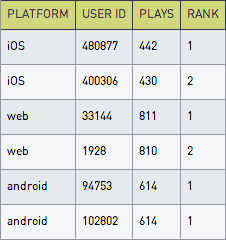 Our partition by platform makes the rank() function give us a separate rank for each platform. Superficially, window functions are similar to your basic “group by” functionality. However, rather than subdividing tables into exclusive “groups” of rows and collapsing them, window functions can look at arbitrary “windows”, and do so without collapsing the windows into a single row. rank() — The function, which aggregates, ranks, or filters the rows in the partition. over(...) — The window, which specifies which rows the function applies to. partition by platform — Which subset of rows are considered. In this case, all rows with the same platform are in this partition. order by plays desc — The order of the rows in the window. This is especially useful for functions like first() or row_number() which depend on ordering. Finally, the over() window definition can also have a row specifier, which further restricts which rows are in the window. 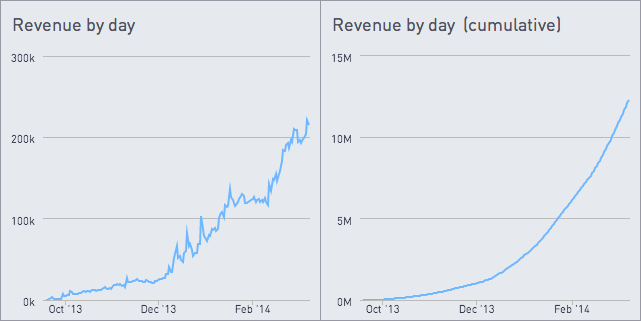 The Cumulative Metrics section above goes into this in more detail. Window functions are evaluated after the join, group & having clauses, at the same time as other select statements. That unfortunately means your window functions can’t refer to other fields in the select statement. To do this, you’ll need to wrap the select in a subquery and put your window function in the outer query. Window functions were defined in SQL:2003 and are available in PostgreSQL, SQL Server, Redshift (which suppports a subset of Postgres’s functions) and Oracle (which calls them “analytic functions”). Unfortunately they’re not supported on MySQL, though you can get a lot of mileage out of variables and group_concat. Predicting Exponential Growth with SQL, in which they calculate a regression of exponential data. Use window functions for time-series percentages, in which they make a time series proportional. Generate Series in Redshift and MySQL, in which they replace Redshift’s unfortunate lack of generate_series. 4 Ways to Join Only The First Row in SQL, in which (spoiler alert!) one of the ways is to use a window function. ASCII Art Charts in the Terminal, in which they auto-scale our ascii charts.